The Nats have been pretty terrible since the season began – and it’s hard to pinpoint just one reason why they’ve been so bad. They’re not hitting well, they’re not fielding well, and they’re not pitching well… Actually, the overall pitching has been ok – team ERA is 12th in MLB, not at all what we expected, but not atrocious. The much-maligned bullpen is also middle of the pack, 13th in MLB with a 3.33 ERA. No, it’s not really the pitching, although the bullpen has managed to give up runs at the absolute worst times, it’s hard to really blame them. The fielding is awful, and that has to get fixed. But, fully 40.9% of those league leading errors have come from Ian Desmond, and there is a history of bad Aprils from him, so there is some thought that this will change with the calendar. But the hitting, ohhhhhhh the hitting. The team is 25th in MLB in terms of OPS, 26th in OBP and 29th in average. As for hitting with RISP, well, it’s still ugly. But at 23rd in OPS, in 22nd OBP and in 20th AVG, it’s actually been better than the way they hit without RISP. So why is it so bad? I have no idea. Slumps? Bad weeks? Who knows? 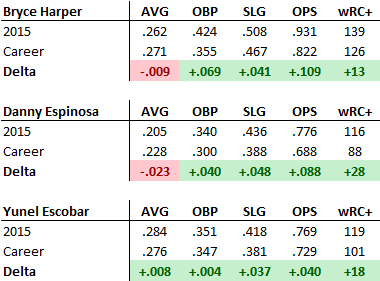 So, the good news is, Bryce Harper looks like he’s truly breaking out, Danny Espinosa has been a strong fill-in, and Yunel Escobar seems to be a very good pickup so far. The bad news is, Espi, unless used mostly in a platoon role, probably isn’t quite this good. And, of course, Escobar has had so much time in the majors that we know he is bound for a correction. It gets worse as you go down, and it’s easy to look at this and get pretty depressed. This team has been awful. Espinosa isn’t a full time player, so other than Harper and Escobar, this team has been unable to hit. Like, practically at all. But look at it this way – this is the crap you’ve already lived through. You watched them do this. So now it’s time to move forward. And moving forward will look better. Most of the guys on this list are likely to bounce back in major ways. 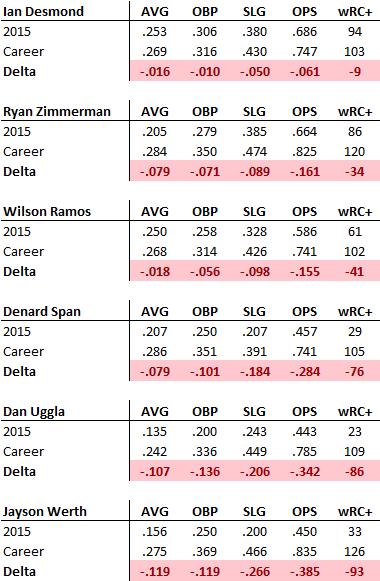 Desi is close enough to his regular numbers that he might not get much better, but Ryan Zimmerman, Jayson Werth and Denard Span are all performing significantly worse than their career numbers. That’s what gives hope – these guys are doing so poorly that we know things will improve. Wilson Ramos should be better, too, even if you don’t believe he’ll hit those career numbers. With Dan Uggla we don’t know what’s gonna happen. So, will this team hit better? Absolutely. These guys are hitting so much worse than their normal career numbers it has to improve. But when will that happen? For that, I have no answer.